The first signs of Spring are finally brightening up our days. And what better way than celebrate the new season than a green-loaded recipe? 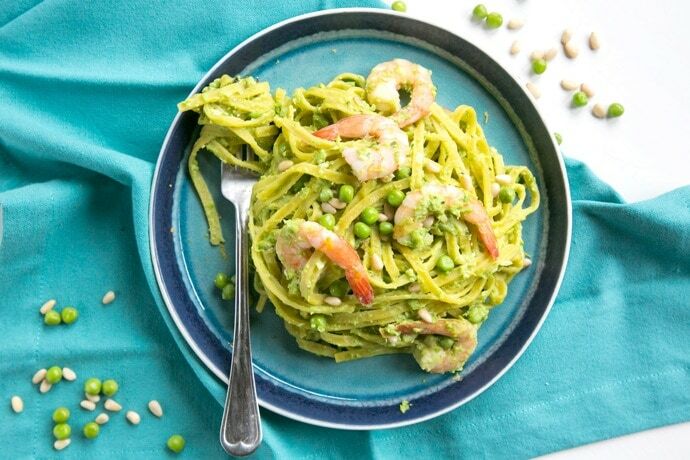 This Pea Pesto Pasta with Prawns is definitely becoming one of my favorite things to eat lately- me and the rest of the family can’t literally have enough. It’s light, packed with seasonal flavors and only requires super simple ingredients. 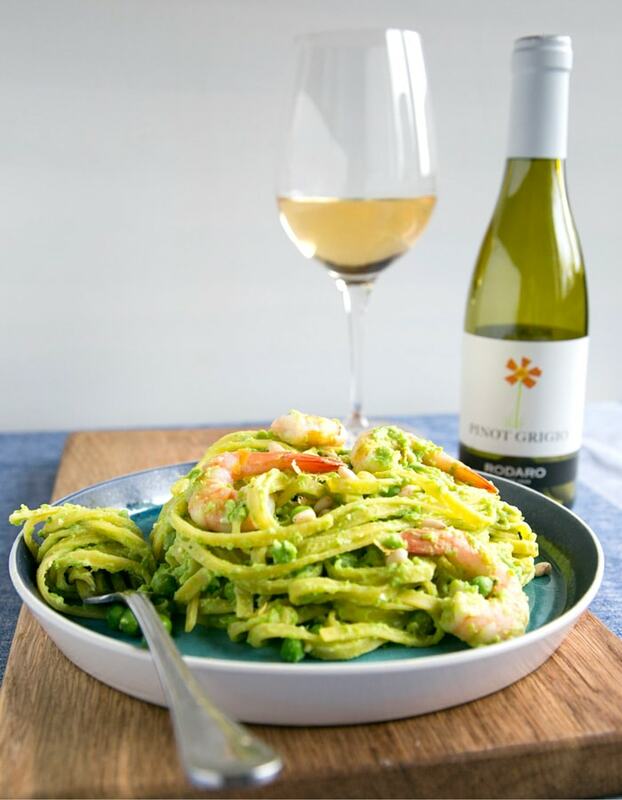 What I love the most about this Pea Pesto Pasta with Prawns is that is effortlessly easy to put together in less than 15 min, but looks fancy enough for special occasion, served alongside a nice glass of white wine. Talking about wine, I’ve been thinking for ages about doing a food&wine pairing post. So I immediately jumped on board when Pulp Wine got in touch with to offer me this kind of collaboration. Pulp Wine offers a monthly subscription wine tasting box, paired with online wine lessons. How does it work? You get 4 half bottles of hand-picked wines delivered straight to your door each month. You can taste and compare the wines and learn more about them through the online lessons. It’s basically an online wine learning class that you can take in the comfort of your home! A subscription to Pulp Wine costs £35 per month, including delivery and wine lessons. If you want to give it a try I have a special gift for you! Get 50% off your first box by using the code TPC50 at the checkout. I’ve sat down with Pulp CEO and sommelier Paolo, and we decided to go for the Pinot Grigio. This dry golden-looking wine has a savory aroma, with hints of apricot and lemon and it’s just the perfect match for my Pea Pesto Pasta with Prawns. It nicely balances the sweet taste of peas and tangy aroma of lemon zest in the pesto, and goes extremely well with meaty and rich fish (such as cod or monkish) or seafood such as the king prawns I used in this pasta. Now, let me just talk a bit more about the sauce, because it’s unbelievably GOOD. Whilst traditional basil pesto has a special pace in my heart, I’m quickly becoming obsessed with this simple sweet&tangy pea pesto. Fresh or frozen peas, garlic, lemon, pine nuts and a handful of basil leaves all come together to make an awesome vegan sauce, which goes wonderfully with pasta, but it’s just as good spread on toasted bread or used as a dip and served with crunchy veggies. Best part? This pea pesto is ready in 5 min and freezes really well, which means you can make a big batch for the freezer and enjoy all year round. 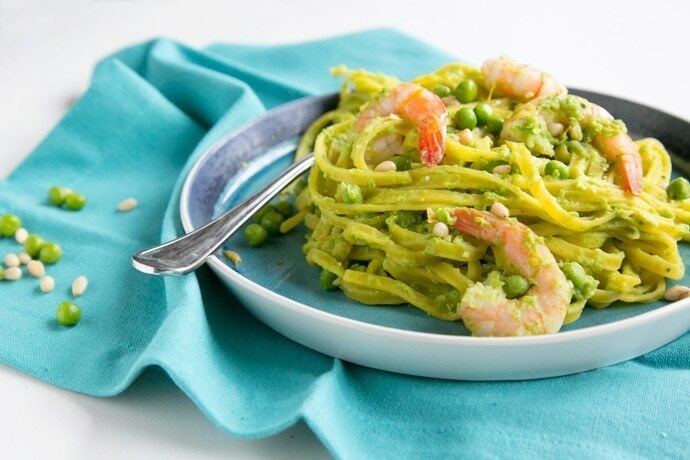 If you’re looking for a light dairy-free pasta recipe to enjoy all spring long, look no further – This quick & easy Pea Pesto Pasta with Prawns is sure to become your favorite meal this season! Looking for a light dairy-free pasta recipe to enjoy all spring long? Look no further! 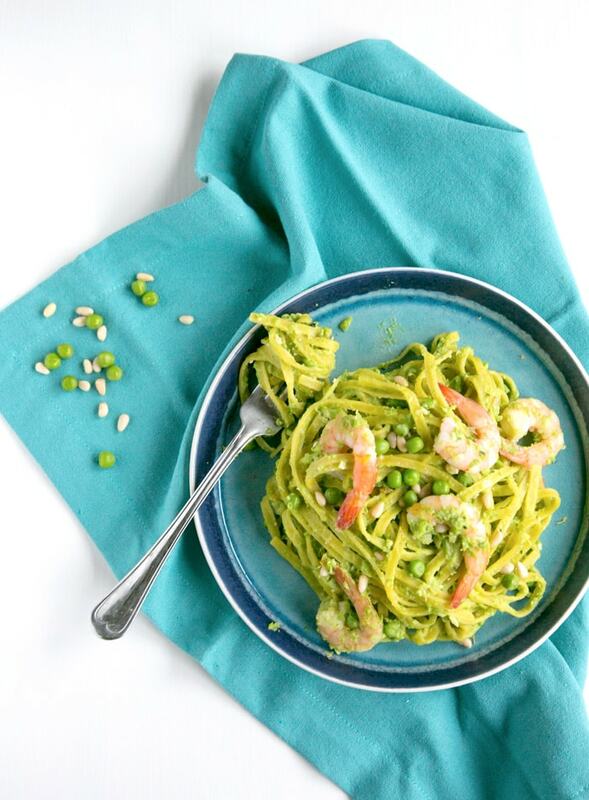 This quick Pea Pesto Pasta with Prawns is sure to become a favorite meal this season! Cook the peas in a large pot of boiling water for 2-3 minutes until just tender, then remove with a slotted spoon and transfer in a bowl with ice and cold water. Drain, pat dry and set a handful of peas aside for garnish. In a food processor add cooked peas, lemon juice & zest, garlic, pine nuts, basil leaves, olive oil and a generous pinch of sea salt and black pepper. Blend until smooth for about 1 min, scraping down the edges with a spatula half-way through. Add the pasta and prawns into the pot where you previously cooked the peas. Add 1 tbsp of salt and allow to cook for about 3-4 mins, until pasta is tender and the prawns are cooked through. Reserve 50ml of cooking water and drain both pasta and prawns. Transfer them into a bowl, stir through the pea pesto, reserved peas and a little bit of cooking water for a creamy result. Mix everything well, and add sea salt and black pepper to taste. Divide the pasta into four plates and serve immediately. This post is sponsored by Pulp Wine. I am a huge fan of this brand and I’m really proud to collaborate with their team. Thank you for supporting the brands that support The Petite Cook! I love pea pesto, it’s got such a great colour and flavour. This is a lovely Spring recipe. I’ve never made my own pesto, but prawn is my food heaven so need to try this. This sounds lovely!! I love pesto pasta, well..I love any type of pasta! I reckon I could give this to my kids, without the prawns, and call it superhero pasta! I like the name :D! This sounds so delicious and perfect for a sunny Spring evening. This pesto sounds fantastic! I haven’t had prawns for such a long time but may need to give this recipe a go in the very near future! I’m hungry after reading this post, haha. It looks amazing!! Thank you for sharing. I don’t eat prawns that much often, but in this recipe they’re a winner! I choose wine based on how pretty the label is so online wine tasting sounds like it would be perfect for me. 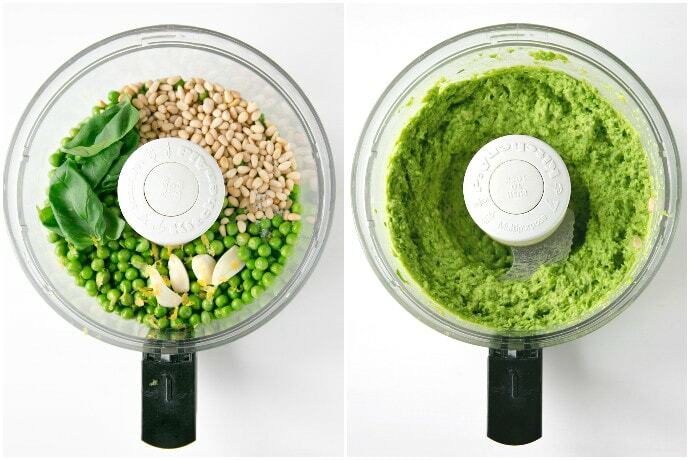 Love the sound of your pea pesto. Such a vibrant shade of green. I don’t eat prawns but that pesto sounds like it would be great on its own anyway. I love that its dairy free and what a fab colour! Pulp Wine subscription sounds like a fab idea if you want to learn about wine. I love it when you can do those things in the comfort of your own home – so much more achievable! I’d not heard of Pulp Wine before! Sounds like this is a match made in heaven! I love a glass of white whine with seafood pasta. You’ve convinced me!